We were hoping for some warm weather so we can get started making hay. You need at least three dry days in a row to do this. So far, the most we’ve had is one sunny day. All the farmers in our area are getting really nervous. 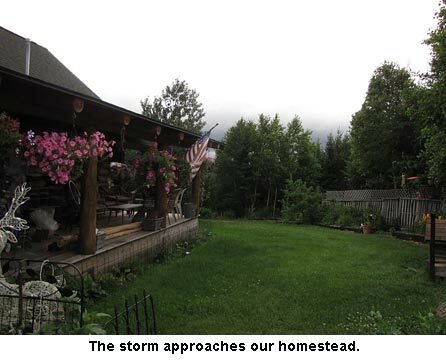 We watched the storm front coming in from the west — a big white roll of cloud in front of blackness. And we prayed we’d get no hail out of that storm. Well, we didn’t get any hail, but boy, oh boy, did it ever pour rain. There was about an inch that fell in less than half an hour. Luckily, the gardens are loving the rain and hot weather. Our first corn is shoulder-high and Will’s Seneca Sunrise sweet corn is nearly that tall. The pole beans have climbed up over head high and are wandering around looking for something higher to latch onto. Thank you so much for thinking of me! However I have another speaking engagement at that time. All my kids were in 4H and enjoyed it so much. I’m hoping you find a great judge. Hi Jackie! My name is Mary Ann Wycoff from Embarrass, MN (we have a farm. Bear Creek Acres (bearcreekacres.com) You and I have met at Earthfest. Longtime subscriber. Love your cookbooks. This summer, our local 4H office was in need of an Interim Program Coordinator and I was asked to fill in. In that position I have the honor of organizing 4-H at the County Fair. I am looking for judges. That’s where you come in…. :) You would be such a great resource! Gee I sure wish I could send some of our rain your way! As they say, been there; done that. Neither end of the stick is much fun. At least we are very grateful we have a good garden. We haven’t even had to run the irrigation pump once this year. Wow, that’s a first! I would sure like to get our hay in though. We did get some baled but rain’s forecast tomorrow so I don’t think Will’s going to cut today. So sorry about the loss of your cow calf pair. We are dryer that dry here in Wyoming. Many forest fires here. Stream flow is so low predicting large fish kill. Very little rain this year. We got a nasty storm on the 16th with golf ball and larger hail. Two neighbors and my garden mosy destroyed. Horrible garden year all over this part of the state. Glad you are getting the rains will pray for 3 dry days for you. Thanks for the support after losing our cow and calf. It means a lot. I would GLADLY give all of you some of our rain; been there-done that. I can remember in Montana one year, watching every tiny little cloud, hoping, maybe, maybe……. and nada. Everyone, pray for the weather to even out for everyone! Very sorry about the cow and calf too. Happy times and sad times both come with animals. Rick Riley it is dry here in south central PA with no relief in site. Temps in the 90s for the next 5 days! So sorry for your loss Jackie and Will it is so very hard to loose animals. Everything looks beautiful! Hope you get those dry days you need soon. So sad for you about the cow and baby. Thank you for the update. So sorry about the loss of your heifer & calf. Your gardens look absolutely amazing! 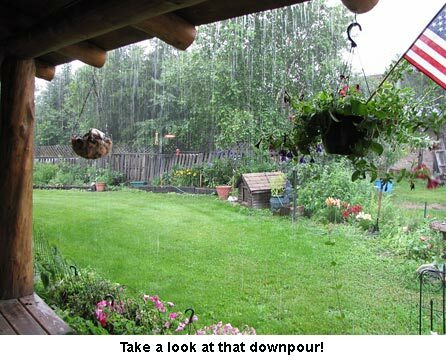 Hope the weather dries out for you soon! Hey Jackie ,so sorry about your cow and calf. Here in north Georgia there is no hay. We’re having a drought, our cattle farmers are very worried. Wish we could trade a few day of sunshine for your rain. So sorry about the cow and calf, the downside of raising animals. But your yard and garden look beautiful. So green and lush. Wish we had a little rain here in our Utah high desert. Just picked the first provident green beans from your seed. They look delicious. Planted some fall garden today. The rains we are having in AL have all skirted our town. I could give you many dry days. Sorry about the cow and her baby. I’m sorry to hear about your heifer and calf. 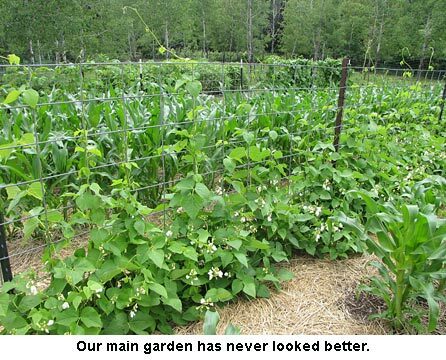 Your garden does look beautiful! I hope you’ll get those dry days, and be able to be haying soon.